Hey guys well our Christmas cards have been sent and most of the presents are wrapped...isn't that just the best feeling? 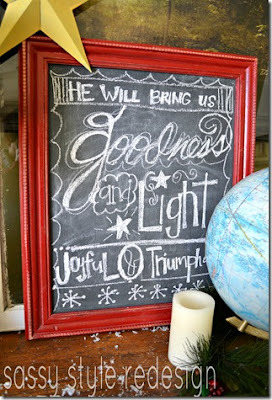 Well check out this fun Christmas Chalkboard Art from Sassy Style! Tausha spray painted an old frame a vibrant red, and then simply painted on her favorite chalk paint. Yup, that's it...easy easy! Literally this project took only 10 minutes, love that! Ahhh, and I love the words she used that reflect the Season! 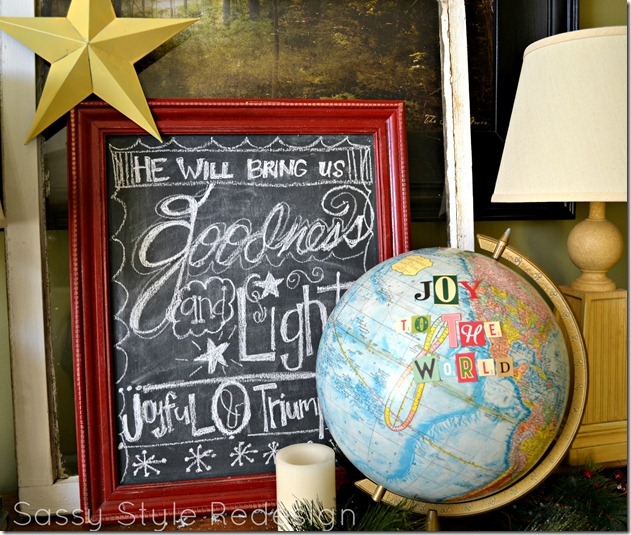 Okay head on over to Sassy Style and get the scoop on this easy and adorable project! Merry Early Christmas to me! Thanks so much for the shout out! Hope that you have a very, merry Christmas! ps-You put sassy sites as my blog in the last line-it's Sassy Style. Simple mistake. Thanks again Jane! So sorry, I just made that change! Love your site btw! Beautiful! Hope you had a great holiday! Oh how pretty! I hope you had a great Christmas and that the New Year brings you an abundance of God's blessings. I love those mirrors. You have some great things on here. You are making me want to go out and go shopping. Have a Great New Year, and thank you for letting me visit and I will check back again soon. The globe is awesome. I'm so doing that next year. thanks for sharing. Happy new Year.